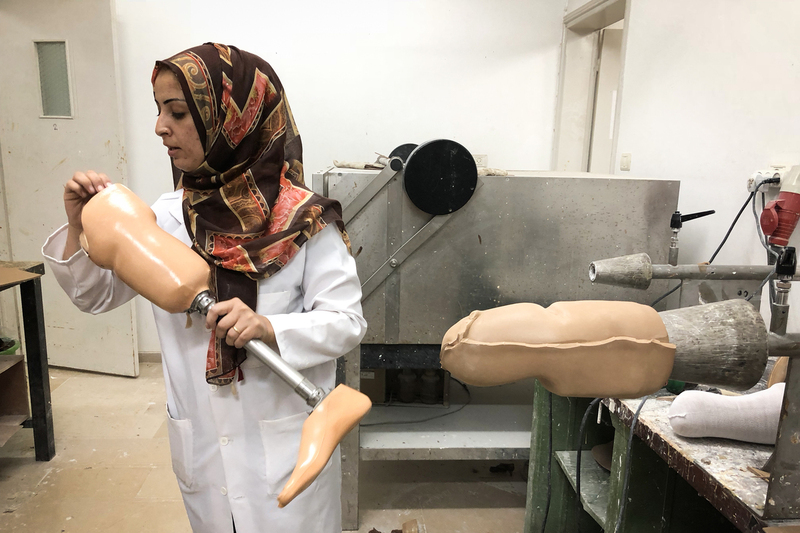 Inside Gaza's Factory Making Prosthetic Legs For Palestinian Protest Amputees As many as 75 Palestinians have needed a leg amputation after suffering Israeli gunshot wounds at Gaza border protests, according to the Artificial Limbs and Polio Center in Gaza City. Palestinian prosthetics technicians in Gaza prepare leg stump casts in the first step of building a prosthetic leg socket for young Palestinian amputees who lost a leg after being shot by Israeli troops during protests at the Gaza-Israel border. A heap of plastic leg sockets rests on a shelf. Palestinian technicians in white lab coats scurry past. They slip into side rooms to sand down leg molds, mix chemicals, cut and polish plastics with big machines, and screw together rods. Tables and floors are speckled with white plaster. Saws and hammers hang from the walls. 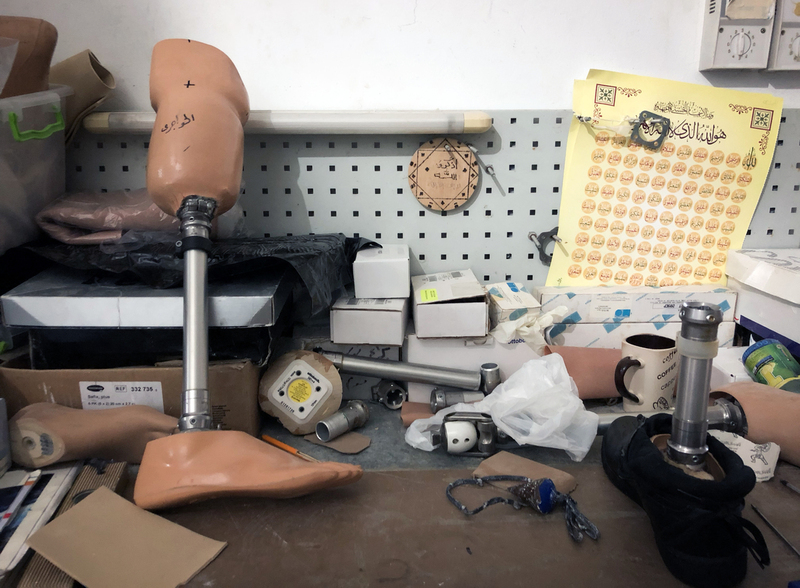 "This is the workshop," says Mohammed Dwema, director of the Artificial Limbs and Polio Center in Gaza City. 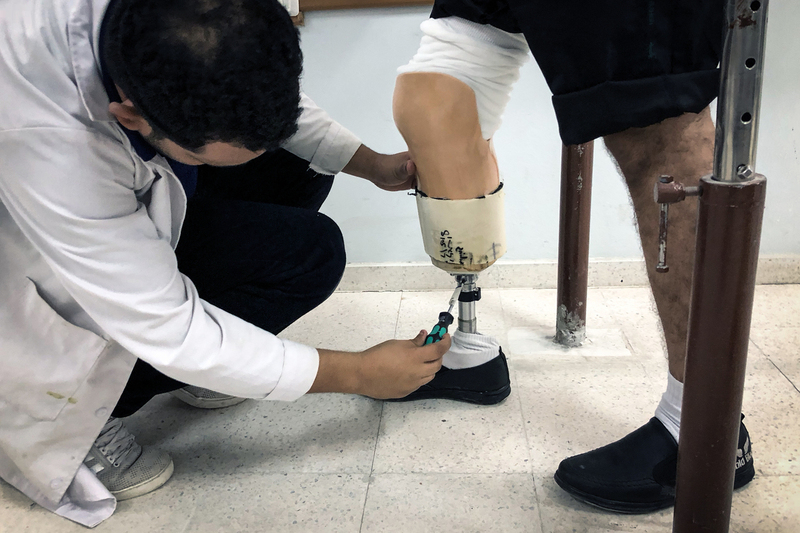 The clinic is creating prosthetic legs from scratch for the first round of young Palestinians who lost a leg to an Israeli soldier's bullet during recent protests at the Gaza-Israel border. The Gaza protests have been going on for months. Protesters are demanding Israel lift its blockade on the territory that is home to about 2 million Palestinians. It is a strip about twice the size of Washington, D.C., wedged by Israel, Egypt and the Mediterranean Sea. Israel and Egypt have kept their borders with Gaza largely sealed and have restricted the territory's imports and exports since the Islamist group Hamas took control of Gaza over a decade ago. Palestinians have described the protesters as unarmed and say many have stayed far back from the Israeli border fence and posed no threat to soldiers. But Israel says the border protests have been violent, with some demonstrators throwing rocks and explosive devices toward the fence, flying incendiary balloons and kites that have set fire to Israeli farmland, damaging the border fence and slipping through to the Israeli side. One Israeli soldier has been killed by Palestinian gunfire at the border, Israel says. Soldiers stationed at the border have opened fire at protesters, and Gaza officials say more than 200 people have been killed and thousands wounded. The Israeli military has not reported a tally on Palestinian casualties. So far, about 75 people shot in the leg have needed an amputation, Dwema says. After months of bandaging, muscle exercises and physical therapy, amputees are ready for a prosthesis. The prosthetics workshop works only three hours a day before a generator runs out of fuel. Gaza suffers from power cuts and fuel shortages due to restrictions from Israel, Egypt and Palestinian leaders outside Gaza seeking to pressure the Islamist group Hamas that controls Gaza. The prosthetics specialists at the clinic work in a hurry; the lights and machines shut off at noon. "We have a problem with electricity here," says Dwema, 33. "There is no fuel every day for the generator. We are just opening the generator from 9 to 12." Gaza's power grid is unreliable, providing only a few hours of electricity a day, so the machines run on a generator, but only for three hours a day. Israel, Egypt and Palestinian leaders outside Gaza have all placed restrictions on the fuel that reaches Gaza, amid efforts to pressure Hamas to give up its control of the territory. The clinic faces other challenges, like restrictions Israel imposes on the import of raw materials to make the prostheses. Israeli officials say they fear militants could get a hold of what they call "dual use" materials and use them for weaponry. Dwema says his clinic needs to create a paper trail for Israel. "We make documentation, how many grams we received, take photo with a number, dates. Like a monitoring system," Dwema says. The workshop depends on the International Committee of the Red Cross to provide the raw materials and coordinate with Israel to get restricted supplies such as silicone to the clinic. "The problem is that Gaza is totally dependent on aid," says Jacques de Maio, who is concluding his tenure as the head of the Red Cross mission in Israel and the Palestinian territories. "The set of restrictions of which silicone is part of is actually a straightjacket that is strangling the ability of Gaza to sustain itself." One floor above the workshop, Palestinian technicians help young men try out a prosthetic leg for the first time. "Short step, short step," says a visiting American prosthetics expert, as she assists a patient teetering on his prosthesis to walk between balance beams. 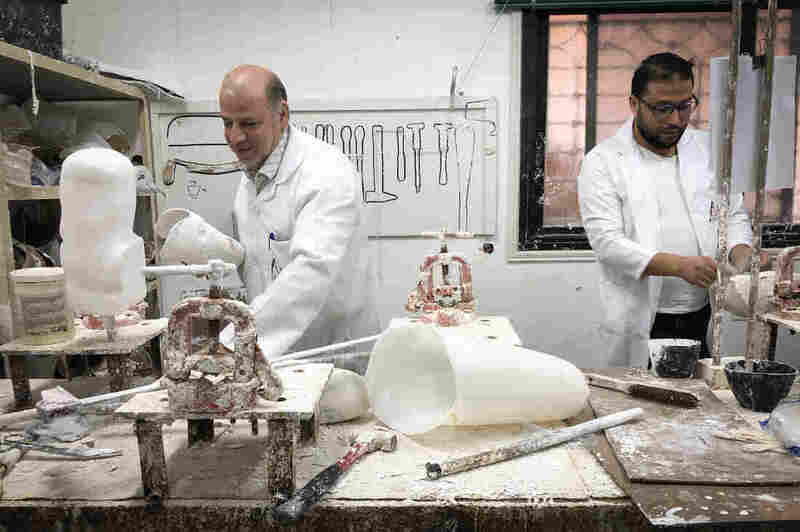 A prosthetics specialist prepares an artificial leg in the lamination room of the Artificial Limbs and Polio Center in Gaza City. In the physiotherapy room, Omar Abu Hashem, 20, is sitting with his left stump folded over his right leg, waiting for his turn. He says Israeli soldiers shot him in the leg in May as he tried to help evacuate a wounded man at the Israeli border. It's not easy for Gazans to travel outside Gaza, but Abu Hashem says his doctor promised he'd be sent to Turkey where better-equipped surgeons might have been able to save his leg. He says he arranged a passport but then his doctor said he didn't appear on the approved travel list. He believes Hamas gave one of its own wounded men his slot, though he offered no evidence to support his claim. "I hold them responsible for everything," Abu Hashem says. He leaves before he could try on his prosthetic leg. He got a call that Hamas was offering cash vouchers to those wounded at the border, and rushed to the bank. The young amputee trying his prosthesis at the balance beams says soldiers shot him in the leg after he helped set fire to an Israeli military post. Dwema says he doesn't ask patients if they were involved in violence or are affiliated with a militant group. He says he is committed to treating everyone. But he cannot afford the high-tech artificial legs that some young amputees have requested. "Patients ask, 'I am a swimmer, I need to swim. I am runner, I am bicycle rider.' I cannot provide with him for a prosthesis that costs $20,000. If I had $20,000, I would buy fuel for my generator," Dwema says. The clinic can provide only the most basic prosthetic legs with limited range of motion. Palestinians who lose a leg after being wounded in the protests can expect to walk again, but with a limp. The center aims to help amputees move on, but some still mourn their loss. Sohaib Qudaih, 31, and Naziha Qudaih, 38, a brother and sister who each lost a leg to Israeli gunfire, say they buried their amputated limbs in a Gaza cemetery. Sohaib says he regrets going to protest. Sometimes, he says, he visits the grave where his leg is buried, to recite passages from the Quran.